Much Sushi info about the game-Games2Rule. 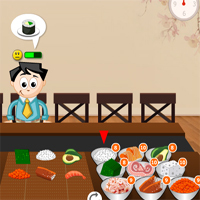 Your sushi restaurant serves the best sushi dishes. So, there are lots of people coming to your sushi restaurant. Serve them well and be fast enough because they can get angry if the orders are given too slow.